The first time I heard about this tea salon was when my daughter, Anna, gave me a gift certificate for Mother’s Day. As much as I thought it was a sweet gesture, I couldn’t help but groan because I rarely go to The Fort area because it’s just too far! 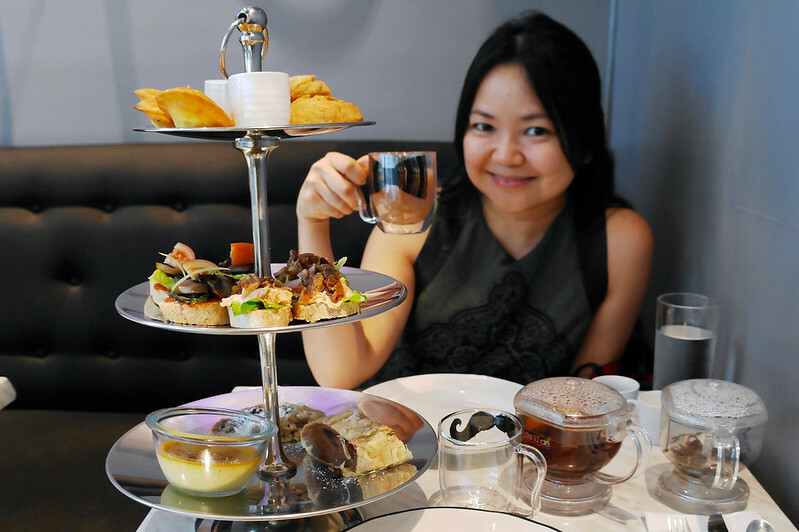 Luckily, I had a few errands to run in the area with my husband one afternoon, so I grabbed the chance to have afternoon tea and a “free” date. 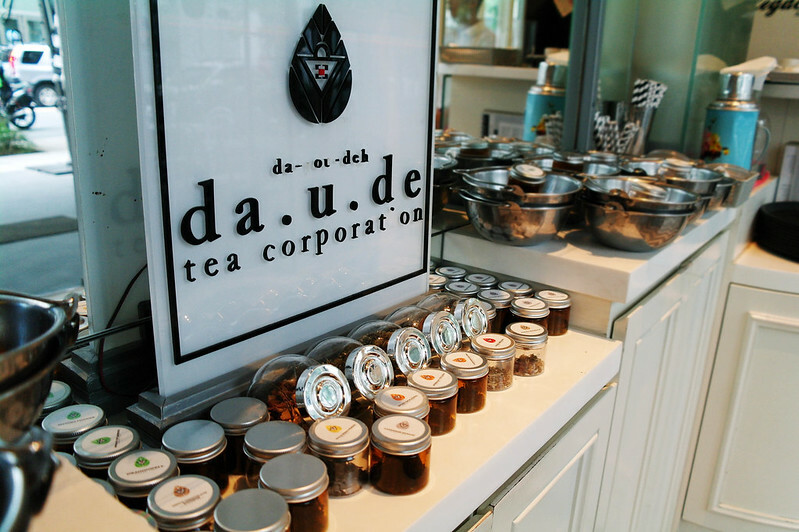 da.u.de Tea Corporation has actually been around since 2009 as a source of organic and natural products such as full leaf teas and even natural beauty products. Their managing director, Renee Sebastian, is the Philippines’ first Certified Tea Master, and she’s very particular with educating her staff about tea – which includes proper preparation (Believe me, it takes more than just hot water), performing traditional tea ceremonies, and rendering quality service at the lounge, which opened its doors in Bonifacio Global City just last May 2012. 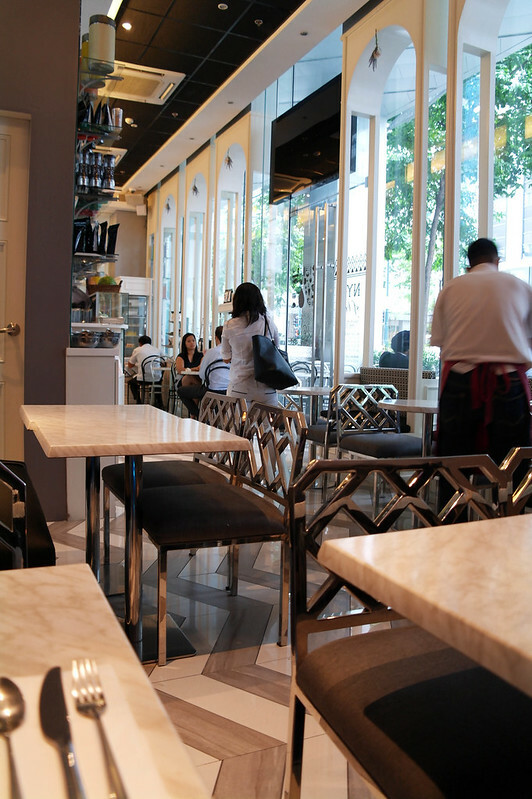 Sure, coffee shops may never go out of season and have been reliable meccas for social gatherings, work, and relaxation, but with the rise of tea salons such as Bizu, TWG and da.u.de, now even tea lovers have a nook to unwind in amidst the city hustle. 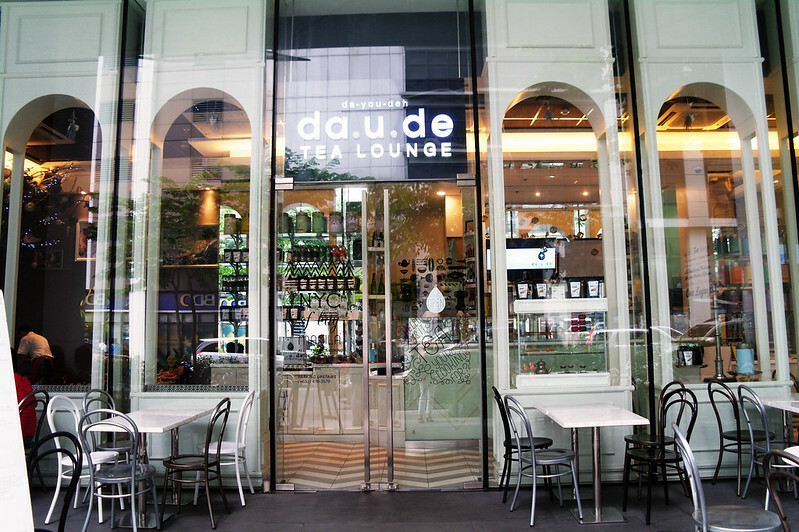 From the outside, da.u.de looks like a modern Parisian cafe with its tall, white wooden arcs that double as discreet booth dividers for the couches by the window. Despite the narrow space inside, the full glass windows let in plenty of sunlight, making the place look a lot more breezy instead of cramped. We went on a Tuesday at around 2:00 PM, so even without our reservation, it wasn’t difficult to get a table. The afternoon crowd were in their mid-twenties up to mid-thirties. Although the place does have that cafe vibe, I wouldn’t suggest you to try to get work done here since almost everyone is either unwinding or chit-chatting. This shelf fronts the door. 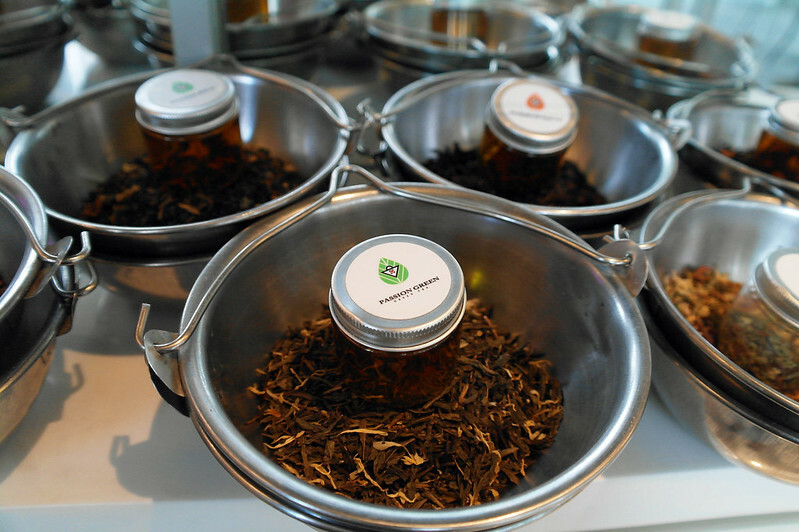 I wasn’t able to take a picture of the glass shelves above the sample teas that held several rows of da.u.de teas for sale in big tin cans. When you get a table, and aren’t decided on what tea to order, you’re welcome to go to this shelf to examine and (more importantly) smell the tea samples. My daughter said she ordered the Passion Green when she visited two months ago and loved it to the point of wanting to take a bag of it home. Because I’m also a coffee person and needed an energy boost at the time, we ordered the Kape suggested by the waiter, which contains Black Tea, Green Tea, Coffee Beans, Cacao Nibs, and Orange Peel. It was just what I needed! By itself it basically tasted like black tea and only smelled like coffee, but when I added the cream and syrup, it tasted like a fusion of mild coffee and milk tea. So, if you’re worried your coffee-loving friend won’t find anything to order at da.u.de, tell them to go for this one. 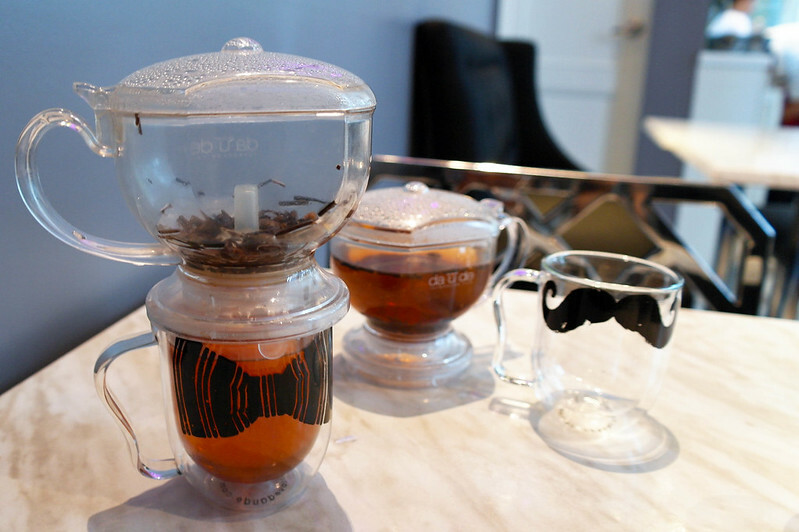 It’s good for 2-3 brews, and you can get a kick out of donning a mustache every time you sip your tea. Excuse me, but I mustache you a question. Nevermind, I’ll shave it for later. My daughter bought us a gift certificate for High Tea for 2 (Php 1,400 + Php 500 per additional person). These aren’t the only food items da.u.de offers. They have entire meals available on their menu, and it’s nice to know they’re all tea-infused. 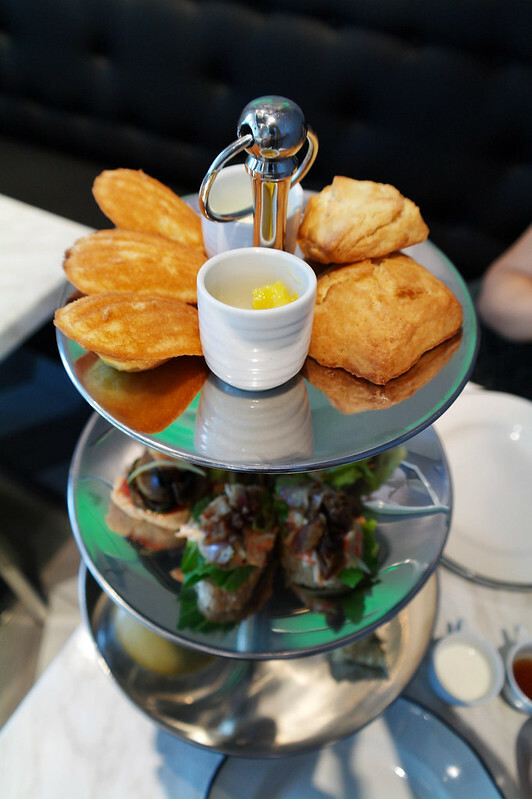 First tier – Three citrus madeleines, one scone or muffin, lemon curd and clotted cream. The madeleines and scones were nicely soft and crumbly, but if we were to award the winner for this tier, it would be the scones. They were perfect with the lemon curd and the clotted cream. The overall citrus flavors made it feel refreshing to eat and went well with the tea. Again, the scones brought it home for me. The second tier was a bit of a disappointment for me. Although considering we came in after lunch, I probably just wasn’t in the mood for anything savory. 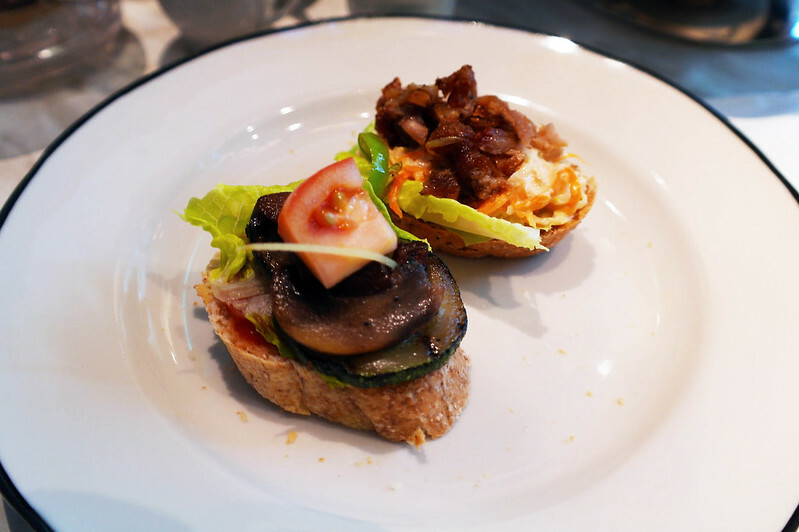 The crostini was too seedy for my taste, and was difficult to bite or slice into. The Roasted Vegetables needed some acidity to it like a dash of balsamic vinegar. The Banh Mi was dry and lacked flavor. Overall, I just wished I had more of the first tier. Ideally, this tier would have a pair of their mini macarons, but since they weren’t available, the server gave us 2 slices of apple strudel instead. Oh, and they serve the ice cream upon request so it doesn’t melt while you’re still going through the first two tiers. 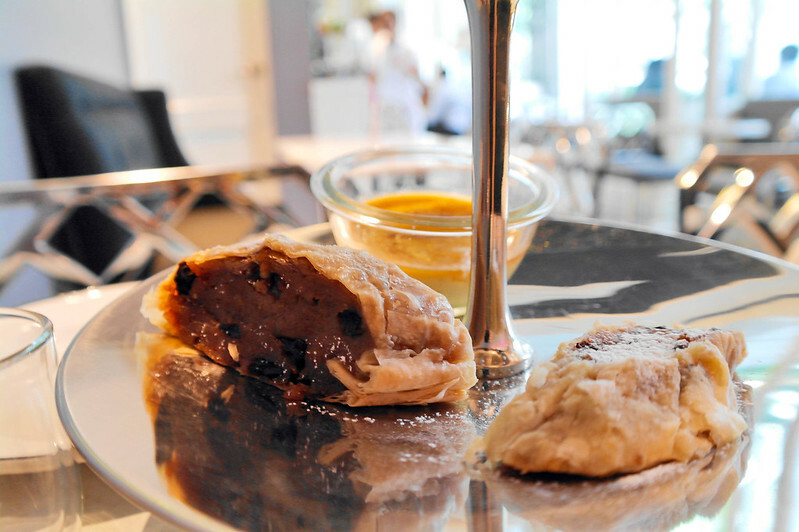 I really enjoyed the apple strudels with the vanilla ice cream. It also helped that they were big servings. The creme brulee was yummy enough, but it wasn’t anything special. Overall, it was an okay experience. For the price, I wouldn’t recommend getting the High Tea set. I think you’ll be able to spend a lot less and get the most out of da.u.de by simply ordering a blend of your choice and those divine scones or an actual entree. It’s a good place for catching up with friends, reading a book or leisurely browsing the web, or for a casual date. 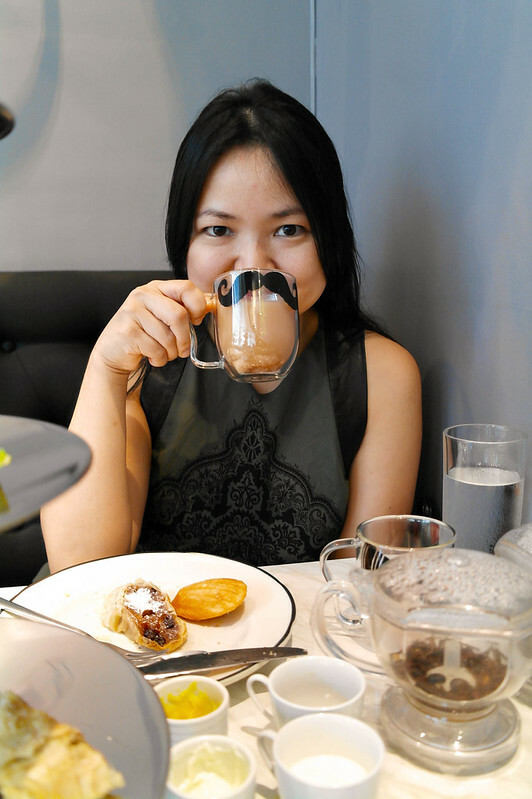 Tags: Beverages, Food, Makati, Philippines, Renee Sebastian, Tea. Bookmark the permalink. Previous post ← Common Fitness Myths Debunked!